we are using the anime, but even in the anime Ash's Cyndaquil didn't learn flamethrower for ages. Quilava learns it even further along, so you should probably have used something like ember, cos it can still hit hard early on. Grayson steps off the boat and says his goodbyes with Murray then begins to walk into Cianwood City. He ends up infront of the Cianwood Gym. "Wonder what this place is...." said Grayson. "Squirtle..." Squirtle is amazed by the Gym and walks in with Grayson. "Well...Well...Well...seems we have another challanger" said a mysterious voice coming behind the waterfall located in the centre of the gym. Then out of no where a large man appears. "That is fine with me. The rules are simple, we will have a one on one battle with no time limit. GO POLIWRATH!!!" A large Poliwrath appears, Grayson and Squirtle are confused with whats happening. "Well arnt you going to call out your pokemon?" Asked Chuck. "Squirtle i think its time for another battle" said Grayson. "Squr....tllllleeeee...." said squirtle scared of his opponent. "Come on, it cant be that hard" replied Grayson. "Squirtle use rapid spin!". "Dodge Poliwrath then use Focus Punch!" yelled Chuck. Squirtle is knocked out in one hit. "HAHAHA looks like i win!" said Chuck. "Come back when you actually have a pokemon that can battle". Grayson ran of to the Pokemon Centre with Squirtle in hands. Green and Gold battled for about half an hour (Trying to save time here by not explaining how they battled the monks) battling monk after monk. "Are we even close to the top floor?" Gold asked Green, "We are on the top floor look it's the head monk" Green said and pointed out. "Hello there, we haven't had some great trainers since a while" the monk said, "Cool, I'm going to battle first" Green said while still holding the egg. "Hold it" The monk said "Let's make it interesting by having a tag battle, me and the top monk against you two" the head monk said. Green and Gold looked at each other, than Green said "All right let's battle!". Quilava has Flamethrower already. And you have a ton of Pokémon. Not that I'm complaining about teh Pokémon, I don't really mind how many you have. "Ahoy there! You're back! Think you can beat me this time?" It was the Sailor again. "Yeah sure, same rules as last time?" "Of course. Let's go Poliwag!" "Hmm, sending out his Poliwag first. In that case, I choose you, Aqua!" The two Pokémon had a stare down as the trainers decided what to do. Aqua was of course more intimidating, but Poliwag was not scared. "Okay Poliwag, Hypnosis then Belly Drum, let's go!" "Aqua, jump into the air and hit it with Bite!" Aqua leaped over the Hypnosis attack, waited for Poliwag to finish it's Belly Drum attack, then KO'd it with Bite. "Huh, nice work kid. Let's see if you can take on Poliwhirl!" Aqua stared at Poliwhirl, and the tadpole visibly slowed down in fear. Aqua had turned to face Charlie, and had just looked back towards Poliwhirl. It was hit. "Poliwhirl, Belly Drum whilst he's switching!" Poliwhirl was hit head on, before it could even use Belly Drum. After almost defeating itself, Poliwhirl was tired. "Blitz, let's finish this off with another Dragon Rage!" Poliwhirl had no chance of escaping, and was again hit straight on. Poliwhirl fainted. "Congrats kid, you got me this time." Chelsea had waited long enough for the answer so she decided to give it up. "Time to move on, Ganny" Ganny nodded and the two kept walking down route 30. "I wonder where we're going next?" Chelsea opened her pokegear and looked at the map... "Oh, Violet City. It has a Gym." She turned to Ganny, "I think we'd better train a bit on the way, and then take down the gym leader" she said. Ganny smiled widely and skipped ahead of Chelsea. Alice got bored of the Ruins of Alph very quickly, and after reporting to Mr. Pokemon and assuring him that nothing was there, she started hearing weird sounds coming from her PokeGear. Assuming it was breaking, Alice took it off of her wrist and stashed it in her pocket. Because that's what you do when a watch is breaking. You put it in your pocket. Anyway, Alice thought that the breaking of her new PokeGear was very strange, so she decided to investigate. After searching through the ruins and finding nothing but incomprehensible glyphs, she noticed her Togepi panicking quite a bit. Togepi ran into Alice's arms and cowered in fear (for some odd reason). Alice thought it best to leave and did so. Or she would have, if some scientists weren't blocking her path. Chelsea decided to camp out on route 30 once her and Ganny had trained for a bit. Ganny rested quite close to Chelsea as she lay against a tree. Just over the horizon was Violet city, she could see the suttle lights. Then some branches stirred above her head. Chelsea looked up and saw a creature's big eyes starig down at her and Ganny. "Ekkk!" she cried. It scared her as it flapped its wings ans flew down to the grass just beyond her. Ganny squeaked and jumped to the ground. Chelsea took out her pokedex and scanned the wild pokemon. "Hoothoot. Owl Pokemon. It marks time precisely. Some countries consider it to be a wise friend, versed in the world's ways. It always stands on one foot. Even when attacked, it does not brace itself using both feet. It switches its standing foot so quickly, it can't be seen. It cries at the same time every day." Chelsea looked to Ganny. "Tiem to catch another pokemon" she whispered. She looked through her bag and pulled out some pokeballs sh'd been saving since she had been 10. Chelsea and Ganny engaged in battle with the Hoothoot, and Chelsea caught it that night. "These strange readings are coming from in here!" "Yes, yes! This could be evidence of the elusive Unown!" Three scientists huddled together, blocking the exit, hunched over a mysterious device. Alice attempted various different ways to pass through them, to no avail. Suddenly, her PokeGear rang. Alice thought this strange, as her PokeGear broke earlier...didn't it? "Ah, Alice! I've recieved word that a mysterious group of criminals are terrorizing the residents and Pokemon of Azalea Town. Can you go over there and report the situation to me?" "Yes, sir. I won't let you down." "Oh, and whatever you do, don't get involved." "Thank you. Your help is invaluable, Alice." She hung up her PokeGear and stared at the three scientists. Then, she had a foolproof idea. "Ghosty, Hypnosis on them!" she whispered to her Gastly, who proceeded to do so. Walking over their slumped bodies, Alice headed to Azalea Town. Grayson, after days of wandering through routes 47 and 48, attempted many times to catch multiple pokemon but would keep on failing. This was until he reached a group of markets with an entrence at the very end with a large sign which read "Safari Zone". Grayson walked up to the door and opened it to find a desk with a lady typing away on a computer. "Excuse me what is this place?" asked Grayson. "This? this is the brand new Johto Safari Zone, where you can capture all kinds of exotic pokemon" answered the lady. "If you would like to particapte the fee is 100, the rules are simple you have unlimted time but will only be given 30 safari poke balls to use." stated the lady. Grayson payed up the money and entered through the door to suddenly find all kinds of pokemon with trainers attempting to catch them. "Squirtle..." said squirtle amazed by all the sights (riding on Graysons shoulder). "Ok Squirtle lets catch us some pokemon." said Grayson running off towards the grassy area. Grayson attempted to capture many pokemon but continued to fail. By the time he was at the rocky/mountian terrain he only had one safari ball left. Then at the corner of Graysons eye he noticed a group of men near a truck. Grayson hid behind a rock. "With this pokemon we will be able to get quite alot of cash" said one of the men. Grayson noticed a Larvitar inside a cage being haulled onto the back of the truck. "Squirtle, those guys dont look like trainers to me, they look more like poachers." said Grayson. "Squirtle!" said Squirtle nodding at Grayson. Green and Gold sent out Charmer and Explotaro while the monks went bellsprouts, "Charmer Smokescreen" Green said covering the room in smoke. "Explotaro use Swift that way" Gold yelled pointing towards what he thought was the monk's bellsprout "Lava Quil" Explotaro said while shouting the stars at the direction. "Missed" One monk said "Attack that Charmander" said the other one. Charmer was being teamed up against "Charmer use Ember!" Green said. Gold stood there and replied "Help Charmer Explotaro!" as Quilava ran over to Green's Direction. Charmer's Blaze ability kicked in and Charmer roared flames in the belllsprout's faces and KO'd them. "Charmer that was Awesome!" Green said running up to Charmer until Charmer glowed a bright color "What's happening" Gold asked. Green got his Pokedex out and read "Charmer is evolving!" Green said remembering how it gained a couple levels since he first got to the tower. "Charmeleon!" Charmer yelled, Gold yelled "Cool!" "What do you think you are doing?" asked Grayson. "Lookie what we got here, a hero!" said one of the poachers. "Lar...?" Larvitar looked up to see Grayson and Squirtle standing there. "Let that Larvitar go!" demanded Grayson. "HAHAHAHA you really think we are going to do that. Go Houndoom!" yelled the poacher. "Squirtle use water gun". Houndoom dodges. "Houndoom use flame thrower!" squirtle is in much pain. "Now finish off this little pip squeek with a fire fang. Grayson realises a defensive counter in which he can combine moves to create a stronger counter and attack. "Squirtle combine withdraw with harden!" The strength of Squirtles teach brakes the fangs of Houndoom. "Squirtle no combine rapid spin with water gun!" Houndoom falls to the ground. "Squirtle break that cage with your rapid spin!" Larvitar is free and now Squirtle and Larvitar are facing the poachers. The poachers run off scared in their car but Larvitar uses rock slide on the goons. "Larvitar how would you like to join us?" asked Grayson. "LAR!!" said Larvitar with a smile on his face. "Go safari ball!" Larvitar has been caught. Grayson walks out of the Safari Zone with squirtle on his shoulder. "Squirtle, i think theres some more pokemon out there waiting for us to catch" "Squirtle, Squirt"
After defeating the Bellsprout leaders he (the outcome depends if we are using tms) 1.. TM 70 flash or 2. Taught Char Char and Explotaro how to light up a dark place with their flames. The duo departed from the tower where they went to the Pokemon Center to heal their pokemon. Gold gave his sentret to Green's grandfather. He looked on Green and said"Are you ready for the gym?" Green said "HELL YEA!". Gold asked "So who should go first?" Green looked and said "i dont know". Gold said " I got an idea lets play rock paper scissors winner goes first." Green said "That sounds fun!" They both said "ROCK PAPER SCISSORS!!!" A voice said " I win!" Chelsea woke the next morning with Nox at her side, snoozing. She straightened up from her sleeping bag and looked around for Ganny. Where was she? Chelsea started squinted into the route's bright morning light. then, over by a bush, she spotted a bit of yellow. Ganny!! she got up and slowly tiptoed around the bush.. but in stead of finding Ganny, she found a pikachu munching on some oran berries that grey there. oh, she thought, Ganny should see this.. but where is she? So Chelsea and Ganny went back to the make-shift campsite and found nox sitting in the tree's shade. "Nox, return" Chelsea said, and then packed up her stuff. She and Ganny then contiued down route 30 untill they were in Violet City. Charlie continued up the lighthouse, training his new Tentacool (nicknamed Beam) and his other two Pokémon. Yea but after so much training wouldnt interpret it to learn flamethorwer. Esther kept wandering til he ventured into a new city. "Huh?" Green said turning around to see a macho buff dude. "Hahaha, well is that how my fans greet me?" he said. "Hey, you're Primo. You are a great poketholanist (I think that's what it's called) , I see you compete on TV a lot with" Green said. "Wow, you truly are a fan. Well I'll give you this Sun Stone!" Primo said handing Green the Sun Stone. "And here is a Soothe Bell for you" he said handing Gold a bell. Alice skipped cheerfully along to Route 33, on her way to Azalea. The beautiful scenery took her mind off of the mission, even if only for a second, and for that Alice was grateful, because of the cave she had to go through to get here. Alice detested caves, they tended to get her clothes quite filthy, but today the travel didn't do too much to her clothes, and thankfully, she carried Repels around. She also caught a Hoppip in a Heal Ball and tried many times to capture a Spearow, but failed. She also picked an Apricorn and put it into her pocket. Growlithe, the puppy pokemon. It is very protective of its territory. It will bark and bite to repel intruders from its space. "Squirtle looks like hes not too happy with you..." said Grayson noticing the anger of Growlithe. "Squir?" Growlithe jumps at Squirtle. "Quick, Squirtle water gun!" yelled Grayson. Squirtle uses water gun but it doesnt do much damage even though Growlithe is a fire type, he is way to pent up. "Ah Squirtle lets bolt..." said Grayson. "Squirtle!!!" yelled squirtle already running away. "Hey dont leave me to defend myself!" screamed Grayson following. Growlithe also followed the two and wouldn't let this up. Grayson ran up a small hill and noticed a rock near by and ducked behind it to notice squirtle hiding there as well. "Your a traitor..." whispered Grayson. "Rrrrrrrrrrr" a growling noise coming up from the top of the rock. Both Grayson and Squirtle looked up to see Growlithe staring down at them. Green and Gold thanked Primo and went to the Gym. "Whoa" They both said looking at how high up the people were away from them. "How do we get up there?" 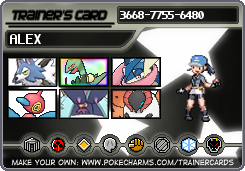 I asked before interrupted by some guy "That's Falkner the Flying Type Gym Leader. Grass, Bug, and Fighting Types won't do ya any good here. Ice, Rock, and Electric Types are great to use here. Go on that wooden panel and go for it!" The man finished. (The guy that seems to be in every gym at the same time is refrences here) "Thanks?" Green said walking towards the panel with gold right behind him. After stepping on the wooden square the floor seemed to disappear as they went upwards. "WHAAAA" Green said almost losing his balance and plummeting downwards. After gaining his balana once more Gold saw a bird trainer "Think you're good enough to take down Falkner? Well you ought to think again!" he yelled at Green before sending out a Natu, "PomPom you're up!" Green shouted as PomPom burst out of her pokeball "A Pom!" PomPom yelled. "PomPom Sand Attack!" Green said trying to blind the foes Pokemon. "Hmph" he said "Natu, Teleport!" and Natu vanished. "What!?" Green said confused to where Natu went "PomPom Stay on guard!" "Now Natu Peck!" he said as Natu attacked PomPom from behind. PomPom finished Natu off and Leveled up but was exhausted from the battle.